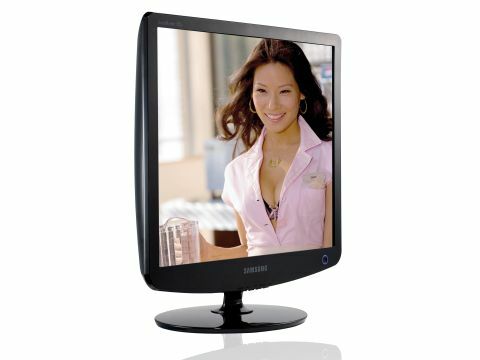 Most TFT screens look rather like a rectangular box that is mounted on a stick, not so with the Samsung SM932B. This is rather curvier and more fashion-conscious than that. It stands on an oval base and the shiny curved housing has a certain similarity to a large iPod, and this image is reinforced by the blue backlight around the power button. The stand is quite simple and the screen simply clips on to a pivoting joint in the base. Overall, it's an impressive looking piece of kit. Once you get over the look of the unit, it connects like any other. Once we'd connected the DVI cable, we spent some time messing around with the CD attempting to install the Magic Tune Premium utility. This turned out to be a complete waste of time as the utility is incompatible with Windows XP. To make matters worse, the unit was configured to Taiwanese, but this was largely due to it being a pre-release model. Once we'd set the monitor to English, we were able to get to grips with the settings, which are fairly conventional and include Color Tone, which controls the warmth or coolness of the white setting. You also get a feature called MagicColor, which has four settings (Off, Demo, Full and Intelligent), which control the vibrancy of the colours, where Demo splits the screen to show 'Before' and 'After'. It should be emphasised that this doesn't help the accuracy of the colours, but gives images impact while allowing you to work on documents without suffering from glaring whites. These settings mean the brightness and contrast figures don't tell the full story as Samsung has added some clever technology into the mix, which delivers an impressive picture at a low price and that makes the SM932b very tempting. We were impressed with what we saw. This may not be the easiest monitor to configure or set up, but once it's up and running, it offers one of the best images qualities we've seen.